Jamie Thomas has enough to deal with trying to get through his junior year of high school without being pulverized by Billy Stratton, his bully and tormentor. But that’s not all. The mother he was always told was dead is actually alive – and she’s an Amazon. Sixteen years after she left him on his father’s doorstep, she’s back and needs Jamie’s help. A curse has caused the ancient tribe of warrior women to give birth to nothing but boys, dooming them to extinction – until prophecy reveals that salvation lies with one of the offspring they abandoned. Putting his life on the line, Jamie must find the courage to confront the wrath of Ares the angry God of War to save a society that rejected him. The three main characters in this novel — Jamie, Billy, and Sarah — first appear in “The Trouble with Billy,” a short story that was published in Steve Berman’s anthology Speaking Out: LGBTQ Youth Stand Up. While the short story is contemporary fiction with a more realistic portrayal of the three characters against the thematic backdrop of bullying, The Unwanted falls squarely within the realm of fantasy. The story is written in the first person and narrated by Jamie, an intelligent, self-possessed, witty and altogether delightful character that is completely accessible to the reader. Throughout the story he interacts directly with the reader by drawing them into his internal dialogue making him all that more relatable. Jamie is an ordinary teenager just trying to get through life, which is made more difficult because he is out at school and must endure his bully Billy Stratton. The return of his mother, and her request that he help save her tribe, places him in extraordinary circumstances and the events that transpire because of her return throw him and Billy together, and along with Sarah, all three find themselves on a dangerous odyssey to save The Amazons. Throughout the story, Mr. Ricker achieves a fine balance between Jamie’s more personal journey of coming to terms with his feelings of anger and resentment due to the return of his mother and his father’s lie about her death, as well as reconciling his growing feelings for Billy (his former bully), while at the same time not losing sight of the action/adventure and inherent dangers of Jamie’s quest, his courage and sacrifice to fulfil the prophecy and save The Amazons. The Unwanted features a truly ensemble cast and all of the secondary characters in this novel, whether recurring or occasional, equally shine. The author transitions the character of Billy in a believable manner from Jamie’s bully, to friend, to love interest, revealing his fears and insecurities, and the reason behind his initial mistreatment and bullying of Billy. The evolving relationship between Jamie and Billy is equally portrayed in a believable manner. Mr. Ricker takes his time in growing the relationship between these two, paying special attention to Jamie’s issues of trust when it comes to Billy. Another aspect of the characterisation that stands out is the prominent role of the female characters in this novel. As Billy’s best friend, Sarah is a tour de force, intuitive, decisive, fearless, and yes even deadly. She does not hesitate in taking on Billy at the beginning of the story in defense of her best friend and she displays the same level of courage throughout the story. Mr. Ricker explores the evolving relationship between Jamie, Billy and Sarah in a forthright manner and the dialogue between the three rings natural and authentic. Their growing closeness and loyalty to one another over the course of the novel is also very much a drawing card in this story. Several of the prominent mythological figures in this novel are also strong female characters. It’s been a long while since I’ve read a story that incorporates figures and legends from Greek mythology and revisiting such childhood heroes as Athena the Goddess of Wisdom and Artemis the Goddess of The Hunt was a real treat for me. While Mr. Ricker assigns each the attributes and roles traditionally ascribed to them in Greek mythology they are not portrayed in a generic manner and several of the more prominent figures, such as the Goddess Athena and Maia, Jamie’s mother, emerge as well rounded characters. 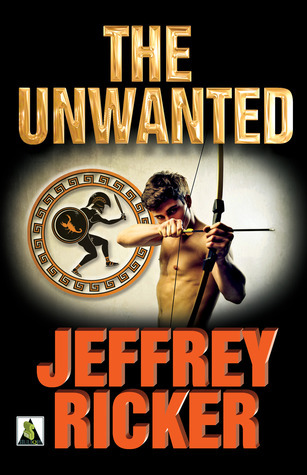 Although The Unwanted is a highly fantastical tale seeped in Greek mythology, at its most fundamental, I found the story to be about family, relationships, trust, loyalty courage and sacrifice. Mr. Ricker maintains an excellent pace throughout the story, once again, by balancing the more personal journey of the characters with the action and adventure of saving The Amazons. He also takes risks in this story providing for a completely unexpected ending that is most befitting the integrity of the characters and their journey, and that is both bittersweet and sublime. In all, The Unwanted is an excellent story that I highly recommend to readers of all ages. The Unwanted by Jeffrey Ricker is available at Bold Strokes Books, Left Bank Books, Indiebound, Indigo-Chapters (Canada) and Amazon US and Canada. Music: The Planets, Opus 32 (Jupiter: The Bringer of Jollity) – Gustav Holts. This entry was posted in Action/Adventure, Arc, Fantasy, Indie Reviews, LGBTQ, Romance, Young Adult and tagged Bold Strokes Books, Jeffrey Ricker by Indie Reviews. Bookmark the permalink. I loved this fantasy tale by Jeffrey Ricker. I was so pleasantly surprised to see how well he took the characters and situations from that short story I loved in Speaking Out and turned it into such an excellent young adult adventure. He really hit all the high notes for young adults with pacing, plot, and relatable characters in my opinion. I’m so glad that you enjoyed it too!